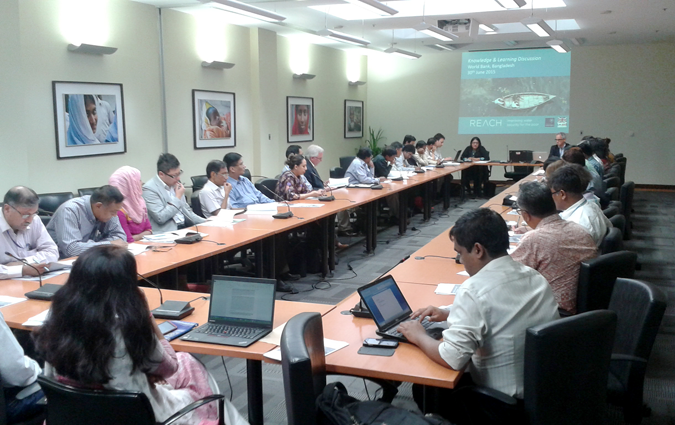 On 30 June 2015 Oxford University researchers and Bangladesh country partners met with World Bank staff for a knowledge and learning discussion on ‘Improving water security for the poor’. The World Bank is active in Bangladesh with a coastal embankment improvement project to protect vulnerable coastal populations from flooding and natural disasters. At the meeting in Dhaka, Programme Director Dr Rob Hope gave an overview of REACH, followed by an address by the Department for International Development Bangladesh Office. You can read more about the candidate Water Security Observatories in the presentation below.